Jai-ca was one of the tapas bars in Barceloneta I discovered when I just moved here. Because it was always crowded and looked good I gave it a try and ever since it’s been a standard for me to have one lunch or dinner at Jai-ca with everybody who comes to visit me here and wants to eat tapas. 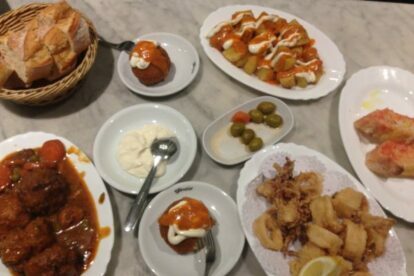 They make the classic tapas, which you can order from a big list and you will definitely order more dishes after the first round. The albondigas (meatballs) are very tasty in kind of a stew with tomato wine. If you are not sure what to order from the menu you just order from the bar where you can see some of the food. They also serve pretty good house wine by the glass for only € 1.70. If the weather is nice you have to be lucky to get a table on the terrace in front of the restaurant. Recently they opened a Jai-ca 2 next door, which is a lot bigger than the first one. I still always try to get a table in the original Jai-ca and if I have time I wait for a table. But if we are a bit in a hurry and need to eat quickly we just go to the new one, in the end the food is the same.